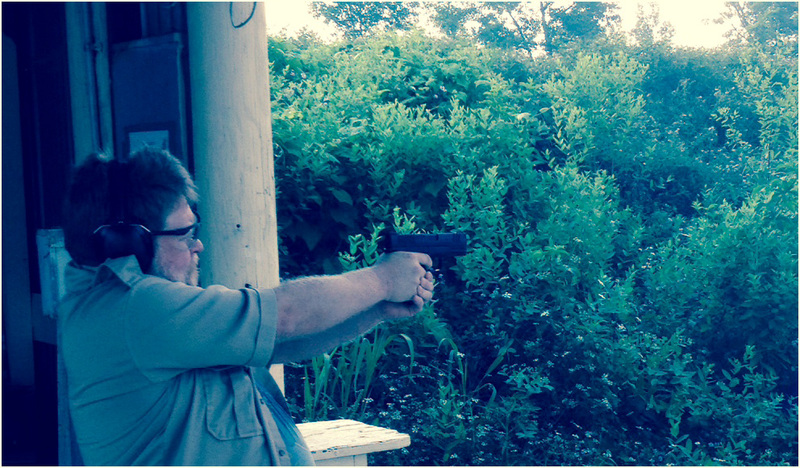 Above picture is your humble author firing “Mournblade” an xDm 9mm recently crazy early in the morning at RedBrush Rifle Range. Finally got back to some practice shooting my 9mm after about 8 months of slacking off. Doesn’t really matter if you are too busy or too tired or just plain too lazy -if you carry a gun for self-defense you really MUST make time to practice. For me (and I expect most shooters) when you don’t shoot for a while you will invariably fall back to the MOST TRAINED\INGRAINED habits. I think this is how Muscle Memory works. And as I’ve mentioned on this blog before I was exclusively a revolver guy for many years. During that time the technique I used to shoot my wheel-guns with everything from .38 snubs to big-bore magnums was a sort of “roll with the recoil” thing. Basically I didn’t FIGHT the recoil. I would just kind of let it happen. After each round fired I would let the gun roll in my hand a bit and then pull it back down onto the target for the next shot. I’m not saying this was a GREAT technique or anything. In retrospect I suppose it worked “OK”. I could hit reasonably well at realistic “combat distances” of 25 feet or less. But the truth is I was never what one would call a great shot back then. After switching to 9mms I quickly learned that this sort of thing doesn’t work at all well with semi-autos! This technique causes a condition known as Limp Wristing. Basically if you don’t hold a semi-auto hand-gun firm enough the slide operation will not be forceful enough and positive enough for the mechanical action to reliably eject the empty cases and pull up and load the new round. This will result in messy Failures To Eject (FTE) and sometimes Failures To Feed (FTF). And that’s exactly what happened to me the other day. My XDM was Stove Piping (an FTE where the brass case sticks on the ejection port of the slide) and there were even a couple of FTFs. Naturally at first I thought it was the gun. But after talking to a friend (Elmo, this would be you) I went back to the range the very next day and shot another 100 rounds through the same gun. I did re-lube the gun before hand as I understand the fact that I had not cleaned and lubed the gun for 6-8 months of carry COULD have also been a factor. But I do think the main difference was this time I made a concerted effort to lock my wrist to fore-arm of my right side. While my accuracy the first day was pretty good – my accuracy this time was even better! And the gun did not fail to feed or eject at all running through 100 rounds across 8 magazines. This is why the shooter needs REGULAR practice and the gun needs regular maintenance. Lesson learned.